Finally got around to solving the problem of the unplayable CDs … two Joni Mitchells and a Kate & Anna McGarrigle, all reissues and from the Warner Bros US stable. A Google search revealed that they are ‘copyright protected’ i.e. unplayable on my computer’s CD drive, or indeed on a Sony player I tried. With a firmware update download from Samsung, I was able to play some familiar tunes from the 1970s, at long last. 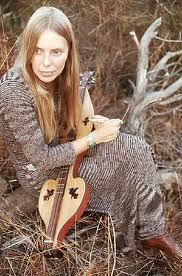 Protection from copying still works, but here’s Joni with an early version of one of the tracks from Blue. The instrument is an Applachian dulcimer, with its origins in Europe. Easier to build than guitars or violins, without any complex curves. Legend has it that Bobby D was listening to this album a lot when he wrote Tangled Up in Blue. http://www.youtube.com/watch?v=BQpZXUGRy1U Now she accuses him of plagiarism … is it serious? Who knows? Not even they do … but the reissue of Blue is worth a listen. I also like her nostalgia-for-the-1950s song on The Hissing of Summer Lawns, In France They Kiss on Main Street. http://www.youtube.com/watch?v=-gwwdh3mX9g Nothing quite as sweet as rebellion remembered.